With the departure on Sunday of the Royal Artillery Band from Woolwich , their home since 1762, it was strangely fortuitous that I came across a file last week in the London Metropolitan Archives which led me to the story of possibly the band’s greatest bandmaster, Cavaliere Ladislao Zavertal. It was my first visit to the archives, and after being issued with my History Card, I checked through the catalogue for local information. I was immediately intrigued by an entry about Bonnie Blink at 67 Eglinton Hill, and it was the first file I ordered from the archive. Who was Bonnie Blink, I wondered? An actress, perhaps, or a lady of ill repute? 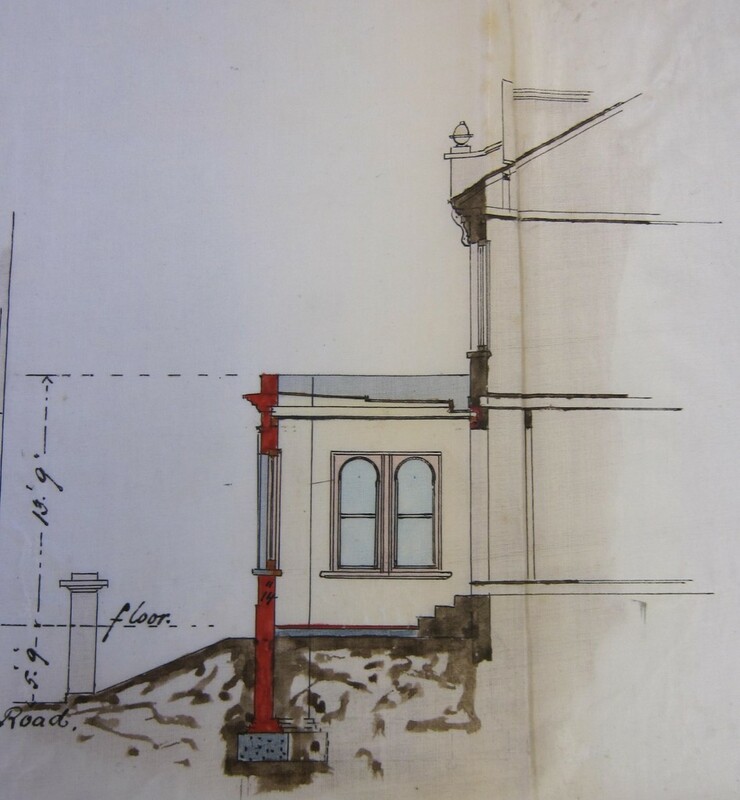 It turned out to be the name of a large house at 67 Eglinton Hill (also then known as 255 Eglinton Road), the home of Cavaliere Zavertal, and the file contained the documents for his planning application in 1897 to build a portico onto the front of his house. 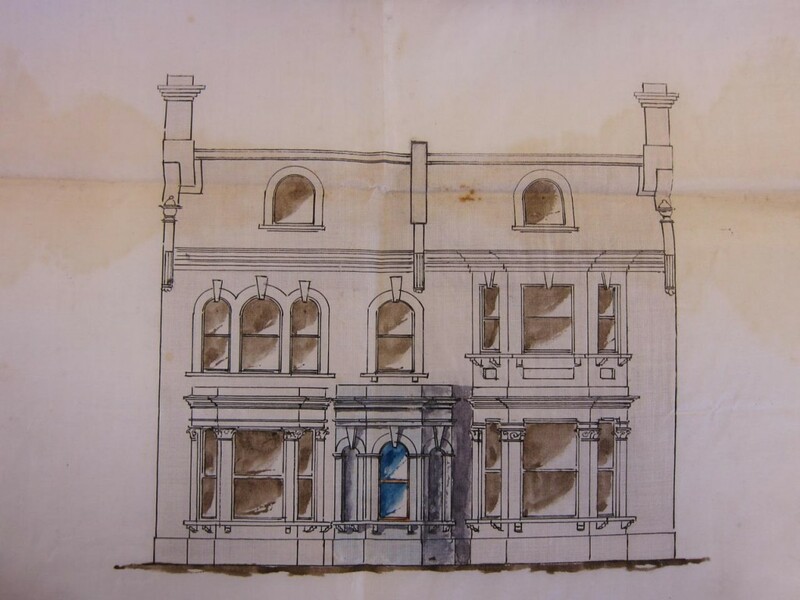 Amongst the contents of the file are a large sheet of drawings and plans detailing the proposed new portico, including the side and front views of how Bonnie Blink would look after the work was complete, shown above. This sheet also has a map showing the surrounding properties at that time: most of today’s houses hadn’t been built. Further down the hill were just the three houses that are now 53 – 57 Eglinton Hill, next door to a nursery – Dallin Road had not yet been created. Next door up the hill, labelled 257 Eglinton Road, was a large house on a wide plot set well back on Mayplace Lane. Interestingly the next houses further up the hill are labelled Portland Terrace, and make up the handsome Victorian terrace that now starts at number 79 Eglinton Hill. The file also contains a delicate, decaying plan entitled “Freehold Land at Shooters Hill Kent for sale by auction by Mr Whittingham at the Town Hall Woolwich on Friday 7th April 1865 at 6 for 7 O’Clock.” This shows the boundaries of the numbered plots of land in Eglinton Hill, Brent Road and Cantwell Road to be auctioned, together with a set of “Stipulations”: for example: minimum vales of properties to be built on the plots; prohibition on carrying out the trade of innkeeper or victualler or retailers of wines, spirits or beer; and, unfortunately for Cavaliere Zavertal, a ban on any part of a property being erected within 20ft of the road. His proposed portico fell foul of this covenant and his application was rejected. 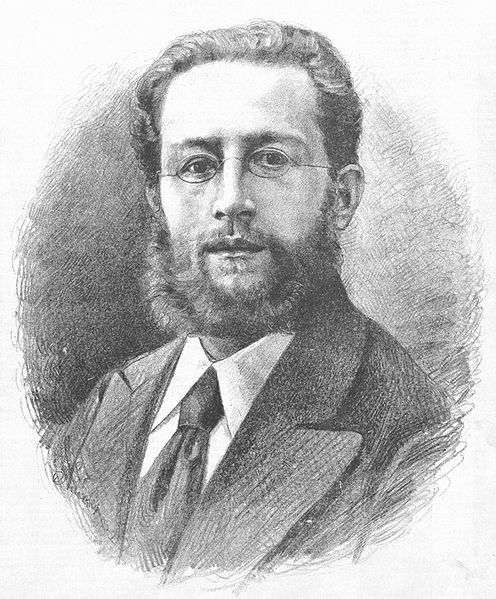 Ladislao Zavertal was born in 1849 in Milan into a musical family: his parents and uncle were musicians of repute. He started his career as a composer and conductor in Milan, and then moved to Glasgow where he conducted the Glasgow Orchestral Society, Hillhead Musical Association and the Pollokshields Musical Association and was Special Instructor to the Glasgow-based Band of the North Devon Regiment. Perhaps it was while living in Glasgow that he came across the house name Bonnie Blink, meaning Beautiful View. In 1881 he applied for the vacant position of Bandmaster of the Royal Artillery Band and was appointed to the position on 10th December that year. Cavaliere Zavertal is now a naturalised British subject, and the senior bandmaster in the service. 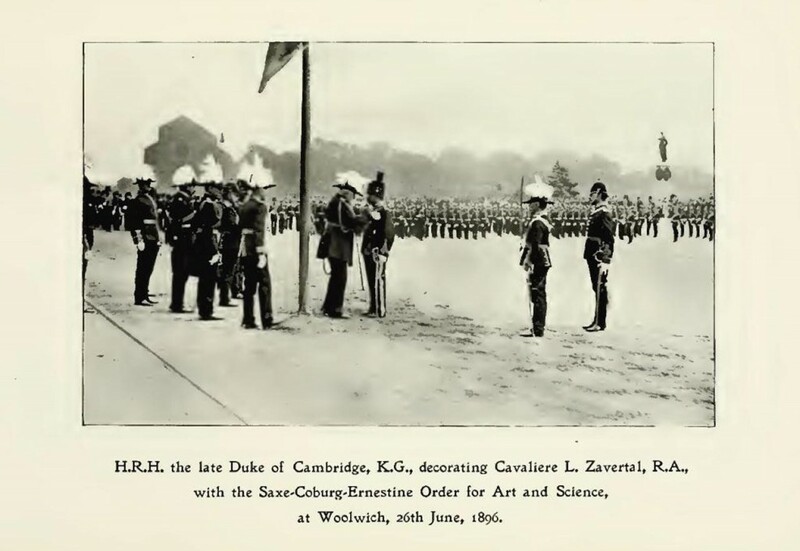 He received his commission as honorary second lieutenant on the 28th December, 1898, which was followed on the 15th November, 1899, by the full rank. For his services during the Diamond Jubilee Celebration, Queen Victoria bestowed on him the Jubilee Medal, and in March, 1901, His Majesty King Edward VII. decorated him at Marlborough House with the Royal Victorian Order, appointing him a member of the fifth class. He has also received official recognition from several European monarchs. For doing credit to the Italian art in a foreign country, King Humbert nominated him Cavaliere of the Crown of Italy. His Majesty the King of Greece conferred on him the high honour of the Order of the Redeemer. The late King of Servia appointed him a Knight Companion of the Royal Order of Takova, and the Sultan of Turkey bestowed on him the Commander’s Star of the Osmanieh. Some years ago a further distinction, valuable because of its extreme rarity, was conferred on him when the Society of St. Cecilia of Rome elected him one of its members. Cavaliere Zavertal retired as Bandmaster in 1906. In February the Royal Artillery Band is departing Woolwich to take up permanent residence in Tidworth. Their departure will be marked with a Farewell Weekend of events. 1425 Speeches & presentations to Greenwich Council on behalf of the Regiment. 1445 Move into Firepower to unveil RA Band display. And what has become of Bonnie Blink now, more than a century after Cavaliere Zavertal’s proposal for a portico was turned down? As the picture below shows the planning process has not been kind to the house. Gone are the beautiful bays and the elegant arched windows, replaced with small, square UPVC framed double glazing. 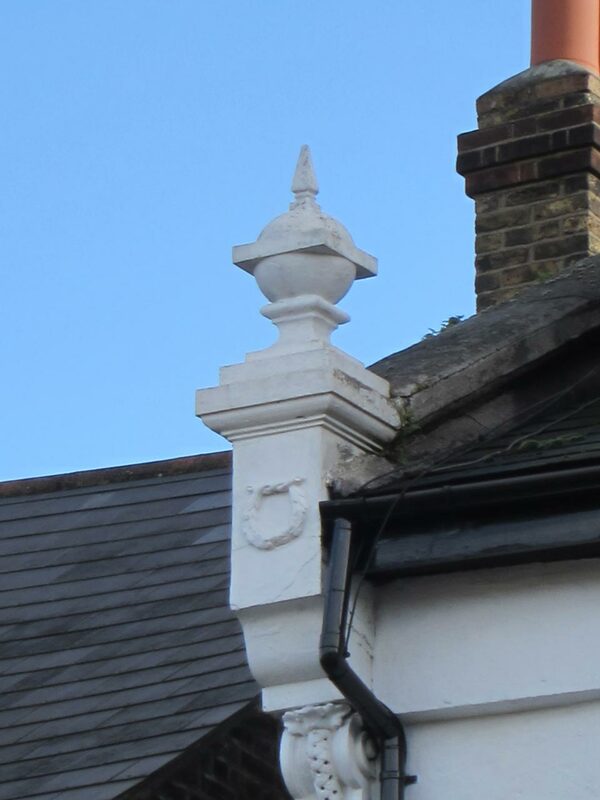 The only architectural adornment remaining, and common to the house now and the drawing at the top, seems to be the stone finials at each end of the roof. I wonder what Cavaliere Ladislao Zavertal would have thought of how his grand house ended up? What a fascinating story and one that makes the criminal destruction of the house even more tragic. What a fine tribute the house could of been. My family has lived in Eglinton Hill since the late ’50s and we have often taked about our dis belief, that the front of the house was allowed to be destroyed (from memory in the 70s or 80s). We have always wondered how the destruction was allowed to happen and what, if any efforts, the council had made, to have the frontage restored. 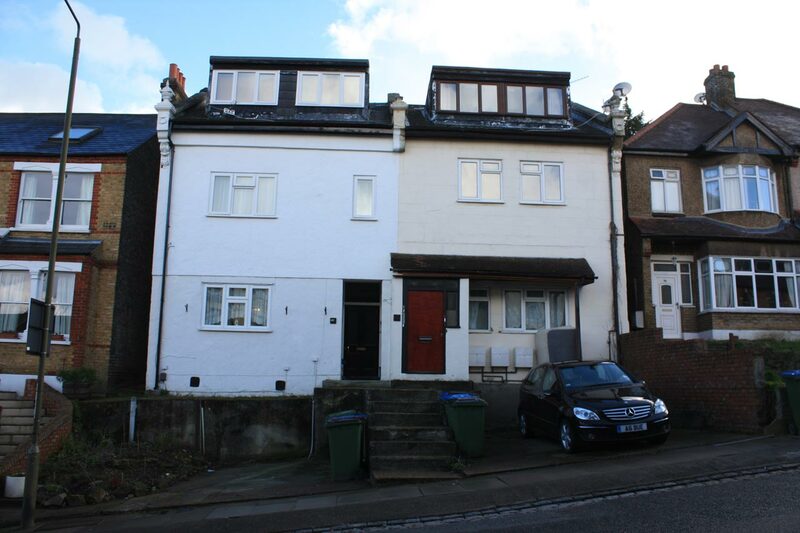 Unfortunately, throughout Woolwich and Plumstead, there are so many similar, sad examples of altered houses, that we had always suspected, the council had done little or nothing to save this house. It would be nice to know if they had cared? We always wondered if the owner had been prosecuted?